Moon responds to Kim Jong Un’s latest remarks by offering another inter-Korean summit. Moon met Kim three times last year and also brokered nuclear talks between North Korea and the United States following tensions created by the North’s nuclear and missile tests and the exchange of war threats by Kim and U.S. President Donald Trump. It’s difficult for Moon to make further progress on inter-Korean engagement without some level of sanctions relief, which Washington says won’t come until unless Kim commits to verifiably relinquishing his nuclear facilities, weapons, and missiles. Kim has shown no signs that he’s willing to give away an arsenal he may see as his strongest guarantee of survival, and Pyongyang apparently has been trying to drive a wedge between Washington and Seoul by appealing to Moon’s enthusiasm for engagement. Moon’s office did not provide a timeline on when his fourth summit with Kim might take place. Last year, there were high hopes that Kim would make a historic visit to Seoul before the end of 2018 for the fourth meeting, but those hopes went unfulfilled. 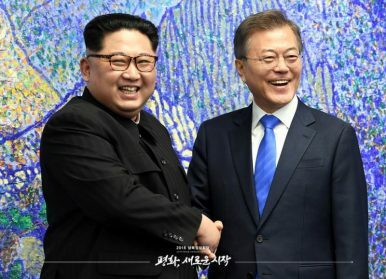 In their third summit last September, Moon and Kim agreed to reconnect the Koreas’ railways and roads, normalize operations at a jointly run factory park in the North Korean border town of Kaesong, and restart South Korean tours to the North’s scenic Mount Kumgang resort, voicing optimism that international sanctions could end and allow such projects. By Kim Tong-Hyung for The Associated Press with additional reporting by The Diplomat.